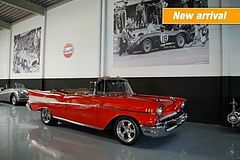 This lovely Bel air has very good paint & all chrome trim is as new. The original full leather interior is in very good condition. This Chevy Bel air came with many factory delivered options such as , power windows , power roof and power steering.